Home and Garden Show - Sew What Sew Anything - Sew What? Sew Anything! Wondering about getting a booth at the Home and Garden Show? Sometimes I feel like it is a roll of the dice to get the word out to the community about your business. This is especially true for small businesses like mine. Each year I evaluate possible marketing ideas and try to figure out which way to spend my time and marketing dollars. I had been contemplating the spring MSU Home and Garden show that is held every March at the Pavilion on the campus of Michigan State University. It is a huge event that attracts many people from the greater Lansing area. So, I made the plunge and purchased a booth – one of the last available booths in late December 2014. I was told that I should attend a three hour pre-show seminar in January 2015 on what to do and how to do a home show. I am sure glad I did attend the seminar, but that wasn’t how I felt at first. Oh boy was I so overwhelmed! I was ready to back out and thought “what have I done.” I learned that I needed to have a great booth display with a back drop and samples. I couldn’t imagine how it would all come together. However I met with my installer, Eric Curtis, who has been working with me since 2007. He had a design in mind and presented it to me along with a cost proposal. I was in good hands with Eric as he has worked the Home and Garden Show for many years through his day job which is installing skylights for Superior Skylights. Gradually my booth came together. I found some great fabrics and made sample valances and drapes. I purchased drapery hardware and created small window vignettes for the booth. Signage – check; shirts with logos – check; flowers – check; and I was ready. I was so worried about the hours involved, especially the time away from my workshop. I didn’t consider how much fun I would have just talking about what I love to do for my clients! I could talk about creating beautiful window treatments and home decor products all day, and I did for four days! Success at the Home Show can be measured in many ways. 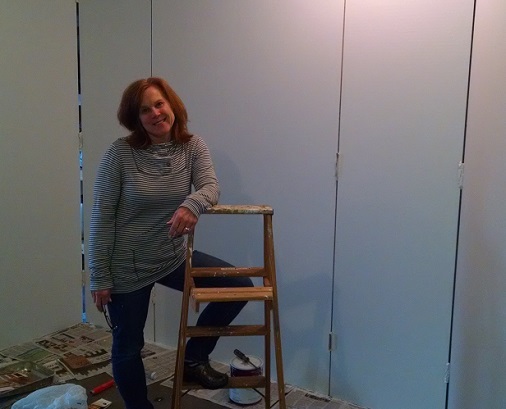 My first success was just the simple accomplishment of being in the Home Show. I had figured it out! My second success was financial. 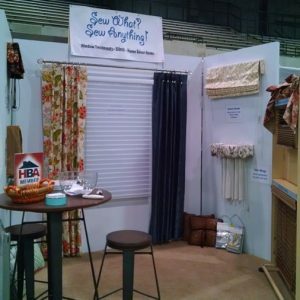 I went into the show believing that if my sales leads from the home show produced enough sales to pay for the cost of the home show entry, the extra help, and the cost of creating the booth; that would be a success. For me the greatest measure of home show success was in setting a goal and achieving that goal. Was the Home and Garden Show successful for me? Yes, it was a great show! Look for me next year at the 2016 MSU Home and Garden show.